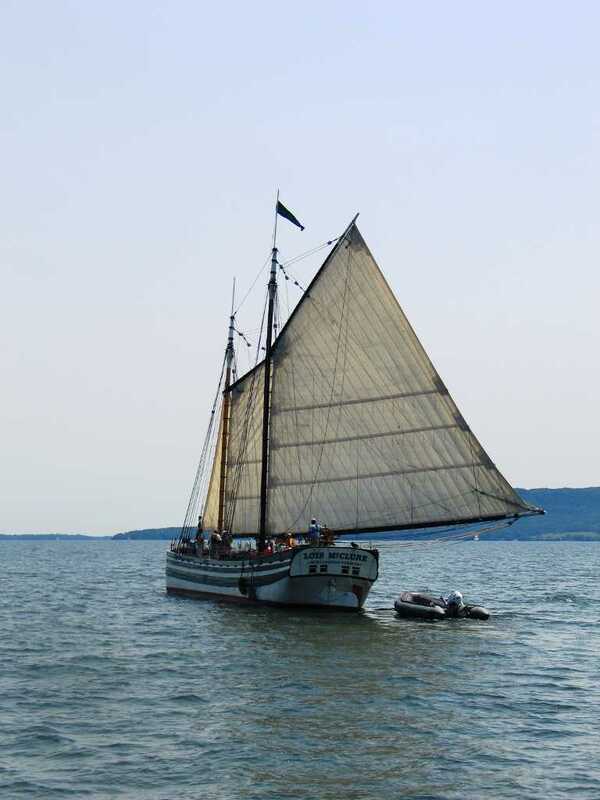 Although I’ve volunteered and worked with the Lake Champlain Maritime Museum for a while, including as an interpreter on the Lois McClure, I had the unique opportunity to be aboard her under sail. It was the first cruise of the 2011 season, relocating from Burlington to Vergennes. After a one day weather delay, we were rewarded with a perfect day to sail. Now I’ve visited the Lois before, toured her at anchor, read her history as well as that of her distant cousins. As wonderful as all that is, nothing brings her to life more than a sail down Lake Champlain. Being an armchair sailor, when our first mate asked “Have you ever sailed a gaff rigged schooner before?”, all I could say was “…Uh…no, but I ‘m a fast learner”. Lots of new terms and actions: throat, peak, rover, avast, belay – and lots of patience, good spirit and teamwork. We left Perkin’s Pier about 9:30am, after an hour of departure preparation. Sails were hoisted an hour later, and with a light but steady north wind were able to cruise for nearly four hours – practically to Split Rock Point. When the wind died, the Lois‘s dear friend and companion, the tug C.L. Churchill, came along side. By 5pm we were safely at anchorage, at the floating dock in North Harbor, and the captain able to make his 6:30pm meeting ashore. And so went my date with Lois.